What's up everyone. Glad to announce I'm back safely in Melbourne. It had been a fruitful week, completing a 3D2N wedding photography road trip around the island of Tasmania, and also a wedding day shoot in Werribee. Photos and videos of the trip will come shortly. 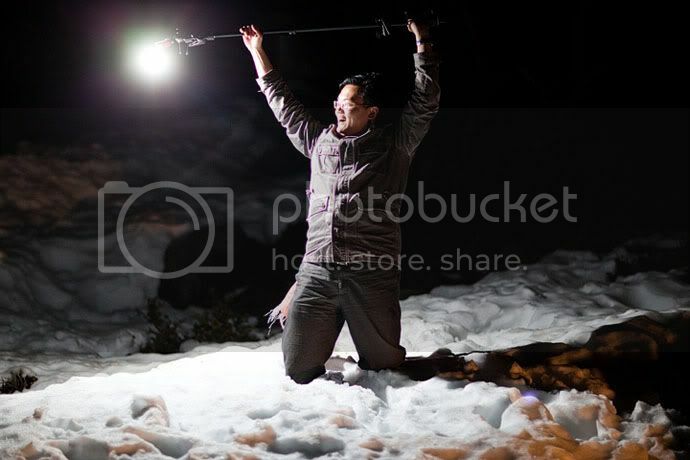 Meanwhile, here is a photo of me standing in knee-deep ice on top of Mt Wellington, at 2 degree celcius, working as a voice activated light stand. The weather is warming up now and I can already hear wedding bells ringing! I am now packing for tomorrow's wedding photography trip to Tasmania. I will be picking up my partners in crime, CF from 1950 photography and Liren from Beauty Magic by Liren Neo at the airport, both coming from Singapore! I love road trips and have been looking forward to this one for a long time. This time, we plan to mix road trip with wedding photography. We have penned down some places to photograph, complimented by random locations along the way! For example, if we come across some places along the way that looks totally awesome (there is no shortage of such places in Tasmania), we will hop off the car and start working! Phone calls might not be answered if I am in some places with no reception, but I can be reached by email. Here are some places we will be going: Cradle Mountain, Hobart, Launceston, and places in between! 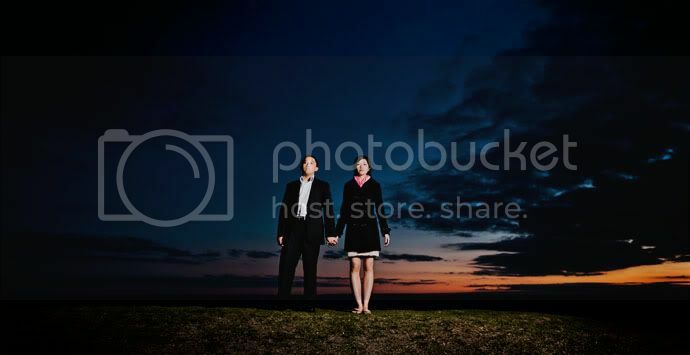 This is the final part of Michelle and Harry's pre-weding photos. Also, please also have a look at part 1 and 2 .. This is taken at one of the popular chocolate shop in Melbourne Central. The expression says it all. This is taken during sunset at St Kilda beach. The liquid is the glass is real white wine. It is surprisling tasty, especially after whole day of work. One of the last photos of the day, during last light. I have the couple holding hands, symbolising the being there for each other till the end. This is the first of many articles written by the 1950 photography team I would like to share. I have worked with the 1950 photography team on a few occasion and learnt a lot during the process. To a professional, the science of wedding photography may be a complex formula involving an intimidating arsenal of photography equipment, optimal lighting conditions and the perfect moment in which the target is caught in his sights. What appears to be a simple image could be the culmination of the photographer’s experience together with the usage of their relatively expensive equipment. Thanks to advances in technology and photography techniques, the level of detail caught can be simply astounding, and a good wedding photo can capture the wondrous occasion with crystal clarity. However, the beauty of such technical excellence is often lost on the lay person. For people like us, the worth of an image is not solely in its technical perfection or aesthetic value, but also the memories and emotions that it invokes. A picture, as the adage goes, is worth a thousand words. But this story of thousand words will be so much more compelling if it tells your story. And so, in the hands of a capable wedding photographer, his equipment and knowledge become more than tools used to fill up a wedding photograph album. Indeed, it becomes a means for him to “write” a diary of sorts. A visual diary of pictures and images that will allow you to relive the best moments of your wedding. Through the photographer’s eyes and skilled hands, we see the events of the wedding unfold like a fairy-tale told by an expert storyteller. Every smile and wrinkle can help us recount the happiness that was felt at that moment in time. Every tear of joy can let us taste the bittersweet flavour of reluctance felt by a loved one. Every laughter caught can feel so real as if the joke had just been told again. 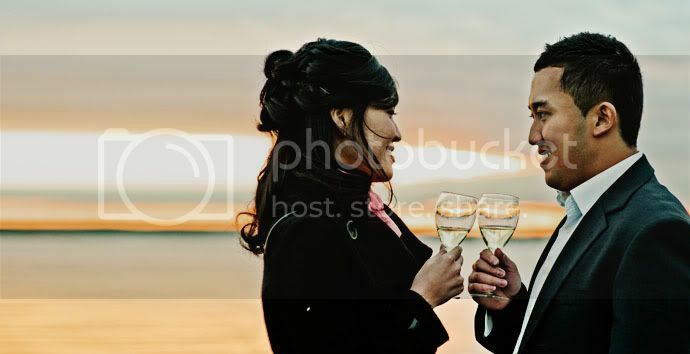 A good wedding photo will let us share that special moment with our friends and loved ones. Even after our memories have become distant and fuzzy; even after we can barely recall the names that go with the faces on the photographs before us. A great wedding photo is one that tells a story. Your story. Welcome to part 2 of Michelle and Harry's pre-wedding photos taken in Melbourne. Don't forget to check out part 1 here . I will start part 2 with this photo titled "Food Fight". 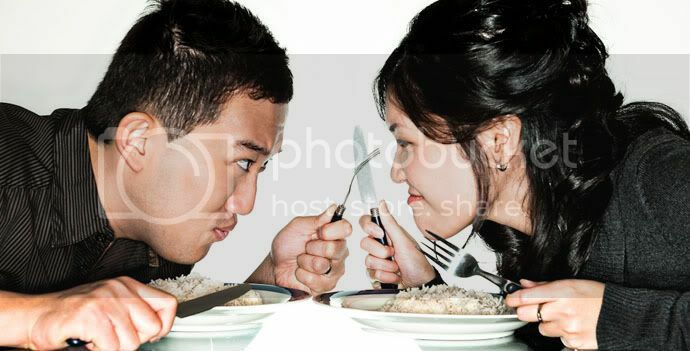 Following up on the food related topic, Michelle and Harry told me that they can't share meals, most of the time. Each of them will guard their own portion closely, at the same time wanting the other party's share. This 2nd photo is my humble work with remote flashes. I named it "Light Night Snack"
Finishing this part off with a photo taken at Parliament House - the most popular places wedding photography has brought me to. Once, I was in one of the six group of wedding parties taking photos here at the same time. Also see part 3 here. Beautiful wedding in the Northern suburb and CBD of Melbourne, a combination of Chinese customs and Western civil ceremony. Enjoy! Wedding photography presentation a roaring success!! More like a humble meow instead. Wearing my favourite What The Duck t-shirt, I gave the best presentation of my life! Glad to see that the audience of approximately 40 didn't fall asleep! 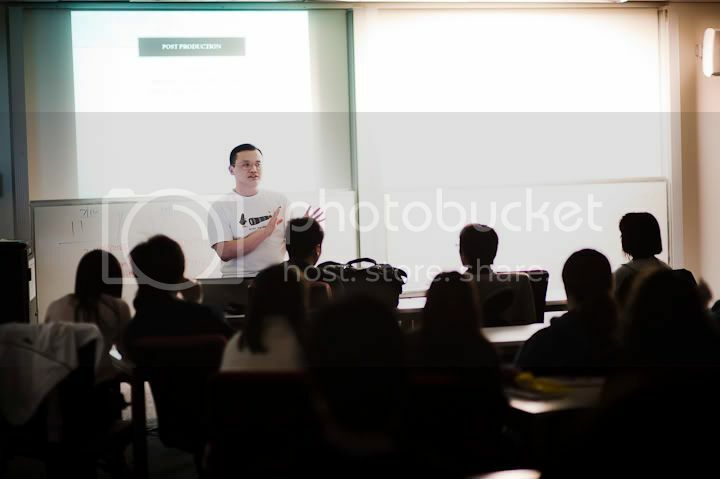 The talk at Monash Photography Club went for an hour and question time took another hour! Some of the audiences are definitely enthusiastic about this!